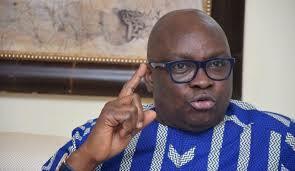 Governor Ayodele Fayose of Ekiti State has revealed why the All Progressive Congress (APC) in the state could not hold a successful primary election. The governorship primary election of the APC which held on Saturday in the state was been marred by violence ranging from protests to carrying of ballot boxes, smashing of the boxes, carting away of voting materials and conspiracy with security agencies in manipulation of the process. Reacting, Fayose likened the APC to a house divided against itself, saying this was why the party failed to conduct a peaceful primary. “The whole world can now see the so-called progressives. Ordinary primary election, the APC could not hold here in Ekiti.These people are hypocrites and enemies of democracy, masquerading as progressives. “Their party (APC) is a house divided against itself, it’s center will never hold,” the governor said in a tweet via his twitter handle on Saturday. Fayose cautioned the Independent National Electoral Commission (INEC) not to allow itself to be used in manipulating the forth coming governorship election slated for July.